Pacers Bikeshare program will add approximately 250 more bikes and 25 more bikeshare stations in 2019. The expansion, funded primarily by a federal grant, will provide Pacers Bikeshare access to neighborhoods, the City’s greenway network, and Broad Ripple. The federally-funded expansion zones include adding station density in downtown, expanding to near downtown neighborhoods, and adding stations along the Monon Trail and other parts of the city’s bike network. 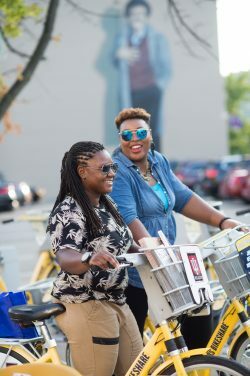 Pacers Bikeshare expansion goals include growing the EveryBody Rides program – which provides subsidized bikeshare passes, bicycle education, and group rides for residents in low income situations – and being intentional about station locations in an effort to increase access for residents in need of affordable transportation. The City of Indianapolis was awarded a nearly $1 Million Federal Highway Administration Congestion Mitigation and Air Quality (CMAQ) grant for the Pacers Bikeshare expansion. A portion of the local match is provided by a grant from the Herbert Simon Family Foundation. In addition to the federally-funded expansion, Pacers Bikeshare will launch a business partnership program for business and property owners who desire Pacers Bikeshare stations on, or near, their place of business.